Cloud computing, also known as on-demand computing, is a kind of Internet-based computing where shared resources and information are provided to computers and other devices. It is a model for enabling ubiquitous, on-demand access to a shared pool of configurable computing resources. Cloud computing and storage solutions provide users and enterprises with various capabilities to store and process their data in third-party data centers, relying on sharing of resources to achieve coherence and economies of scale. We have thousands of servers withing both the AWS and Azure Cloud providers. We need to apply the following tags to all the resources as well as any new resources created in any of cloud providers. what is the best way to implement this ? do know anyone know a script i can utilise to deploy this in both environments? 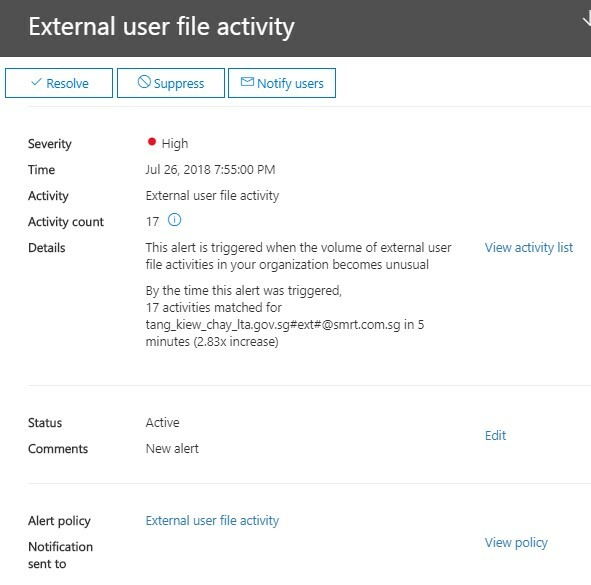 Received this security alert from MS cloud. Is this a safe activity and how to troubleshoot this whether security breach? Tks. I have very limited experience in unix (or whatever the operating system is?) and I'm unable even to find out how to get to a command line to test this. Attached screenshot of some of the bluehost advanced options. I am going to build one cloud based application for multiple customers / businesses, based on that i have few questions. a) One db for all customers, then what about performance? b) or is it one db for one customer? 2) let's suppose, if there is power cut (never but due to some reason) or internet down at customer site, in this case what shall be our responsibility? Possible to use Azure so remote Win 10 computers can logon to Server 2016 servers hosted within Azure cloud? My organization has quite a few remote users. All remote users are using the Windows 10 Professional OS and their computers are joined to the Active Directory domain. We are interested in implementing the latest technology so that remote users will be authenticated to Server 2016 domain controllers that are hosted within Azure in the Office 365 cloud. We don't want to use any VPNs or Direct Access solutions. Is this kind of setup currently possible? If so please provide me with instructions on how this can be set up. Can you people tell me the scenerios, why we add multiple domains in one office 365 tenant account? Can I spin up a virtual machine in the cloud with Barracuda backup? I have backed it up as a VMware VM but not sure how to spin it up in the cloud. How to connect the Add-In for SharePoint? I am interested in trying to use PowerShell against our company SharePoint portal, We have some automation Tools like MS Flow and Alteryx Server that we are leveraging and I am trying to connect to a Workflow History listing. However, it is hidden from these other tools and I hoping Powershell might be an option. I tried following this kind of instruction but had zero success. How to send large files for free? I use WeTransfer but that limits files to 2 GB. What other free options allow a large filesize? Researching on options between G-Suite vs. Office 365 email. Anyone can comment on drawbacks and benefits? Also wondering the pricing structure and difference would be. Loaded question I know and I can comment if any follow-up questions. I want to migrate my Esxi VM from on promise to Azure cloud. I've found solution which provides it to me. Microsoft Virtual Machine Converter, provides migrating to Azure Cloud. During migration procedure application wants " Subsciption ID and Certificate Thumbprint". After generating certificate, i've added it to Azure cloud > Management Certificates. I've also added this certificate to my Personal and Trusted Root Certificates. But when i'm tryin to connect it gives me error. How you ever seen this error ? Or maybe do you know any solution for handle this issue ? Possible to setup offline file sync within Google File Sync within Windows? Is it possible to setup offline file sync within Google File Sync within Windows? We would like to be able to store and sync our documents on our local Windows 10 computers rather than solely having to access these files within the Google File Stream Cloud. If this is possible how can it be done? Sorry, I set up 2 machines - 1 that has onedrive and one that has onedrive for business installed. I keep being told the only similarity / continuity between them is the first part of their name - onedrive. They are entirely different animals?! the ODFB runs on sharepoint? Am I missing something? They seem to have the same functionality. how to montioring to DB2 over the cloud. What cloud solution is for DB2 ? What cloud solution is good for DB2? what that cloud solution ALSO offer more for DB2 and what it is ? What is the difference between Amazon EC2 and Amazon RDS? the problem now is: MariaDB is not fully supported under RDS but Ec2, what is the diff between RDS and EC2? thanks in advance , I would be lost with out the help I get here !!!!!! The habitats.txt file it is looking at is attached. The two other habitats, using identical code to the above (with the exception of !habitat.contains(“Aquarium”) being “Bird” or “Penguin” instead) and they both work. i'm looking for a cloud based backup solution for an SBS 2008 that doesn't cost a fortune. I've shopped around but was getting quotes of €400 a month for 2TB storage. I can get 2TB for client pcs for €40 a year so am hoping there's something similar for SBS 2008.